Thanks to everyone for the great brunch recipe ideas. I was thiiiiiis close to make French Toast Casserole from Paula Deen (thanks to an email from an ERR reader). However, once I read the reviews and figured out that I might have to exercise some baking skills and some discretion regarding the amounts of ingredients, I chickened out. Not surprisingly, I ended up making a Rachael Ray recipe found in Cooking 'Round the Clock. It was a beautiful menu of Crunchy Vanilla-Almond French Toast with Fancy Fruit Topping, Sweet-n-Smoky Bacon. Supplemented by a fruit salad and a cake from my friends and we had a wonderful meal. The french toast was seriously outstanding. As recommended in the reviews, I used Vanilla Almond Special K and that did the trick. I don't know how Rach fits a pound of bacon on a broiler pan. When I tried it, the bacon didn't cook through because the slices were too close together, so I ended up broiling it for a few more minutes and it still turned out great. Maybe I'd do it in two batches next time? Debby of A Feast for the Eyes made a gorgeous Raspberry-Lemon Shortbread Tart from Every Day with Rachael Ray. Katie Alfieri of the Rochester Wellness Examiner made Pomegranate Guacamole. 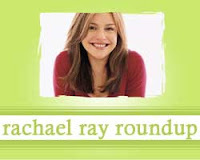 Raine of Magazine Nation reviews Everyday With Rachael Ray. Rebekah of Food Food Food! adapted Rachael's recipe for Buffalo Chicken Club Sandwiches. Jessica of I Was Saying... made Rachael's recipe for Chicken Noodle Hold the Soup. The Examiner's Charles Thorpe informs us that Rachael Ray will be hosting the Blue Moon Burger Bash at the Second Annual New York City Wine and Food Festival. OakMonster at Hmm...Food...Good adapted a recipe for Spaghettini Carbonara Tartlets from Every Day with Rachael Ray. KK of Preppy Pink Crocodile adapted Rachael's recipe for Chili Stuffed Zucchini to create Green Boat Chili. Jessie of Vanderbilt Wife adapated Rachael's recipe for BBQ Sloppy Chicken Pizza. I agree with CaptiousNut of Marginalizing Morons that Rachael's Southwest Turkey Burgers are the best turkey burgers ever.